Towards the end of his book, Justin Hopper invites us back to the 1950s to join John Henry Pull, working at the time with the Worthing Archaeological Society, as he excavates Shaft 27 of the Cissbury flints mines. Working his way down through ox and pig bones, trash from humans’ meals, and uncovering the skeleton of a female mine worker trapped under chalk blocks 4,000 years before, he finds miners’ graffiti on the chalk walls. Some is representational, but one example Pull describes as a “star-spread indefinite flint mark” and Hopper as “a shape-shifting mark; a Rorschach inkblot.... a pair of arms raised to the surface.... [or] just as easily.... the random results of a pick dragged along the gallery wall”. ‘The Old Weird Albion’ is at its best when it is as enigmatic as the graffiti, poised between a loaded, magical significance and a pleasing coincidence. Among Hopper’s companions, as he treads the South Downs of Hampshire and Sussex in search of different kinds of quarry, are one or two ‘true believers’. Indeed, Hopper himself wavers, as if repeatedly coming to a precipice, choosing spaces that challenge him to see, to know, to identify. Yet, so much of what is most moving and eloquent in ‘The Old Weird Albion comes with ambiguity, with only half a story, with evidence missing and ragged surmises. The book – like one interpretation he gives of the Long Man of Wilmington as a figure crushed by walls from both sides – is framed by events at the vertiginous space of Beachy Head; yet even in that binary space there is uncertainty about the accounts. Even more so in the company of Rob Irving, talking about the uses of hoax crop circles as levers upon the true meanings of landscape or the author of The Haunted Shoreline using “the landscape alchemically – to decipher the symbols it threw in his path as means of forging a personal connection to place”. 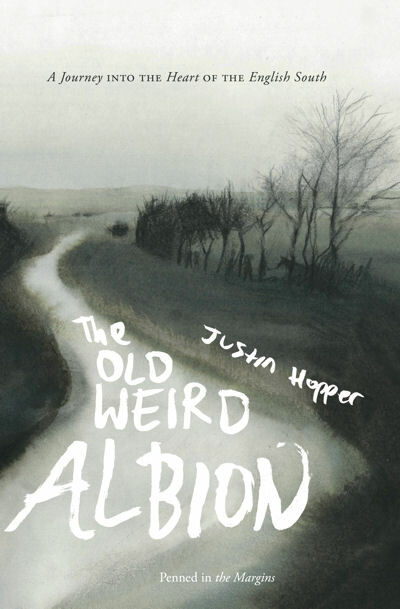 The Old Weird Albion is beautifully well-written and easily read; the stories come quickly and suggestively and the descriptions of the various locales and journeys through them are fresh, vivid and engaging. Villages with spectral histories of Pinkie and Tiffany Mitchell, hidden standing stones, the oceanic green, “spindly downland railway lines”, the “chill” of Balsdean, and hollow ways – in these places, Hopper comes over as a far better interpreter than the autodidactic holy men and therapists he respectfully consults: “In Balsdean I was dislocated, as though the performance of my own life was going on elsewhere and I was backstage, catching only vague signals.... The village doesn’t appear to you as you enter, it recedes away from you”. His subjective responses, conveyed strikingly, say as much about these landscapes as any twitching of dowsing rods or “crouch-running, Navarone-style” from a gamekeeper that is probably not there. On the mound of Chanctonbury Ring, Hopper is “buzzed with a warm confusion” that he imagines is how it feels to be “believing in something, truly and deeply believing”, yet this book is warmest when its bells ring without explanation, when the Goddess mutters a banality in a dream, when ghosts flash in the corner of vision and then flee, when the old authorities are Saxon myths invented to explain Iron Age ruins, and when Hopper confesses “there was an unseen watcher, and it was me”.